Dr. McSoapy is an informative and entertaining speaker. For starters, he talked about molecules being like nerds and cheerleaders. As he talked about the attraction of molecules to one another, he brought in the analogy of relationships between high school nerds and cheerleaders. My spell check doesn’t like those last three words! Seriously, I’m not kidding. He had us laughing throughout the session. Were you there? Did you laugh? I took lots of notes. These are just from the first few minutes. A Triacylglyceride is 3 acyl molecules (pronounced with a long a) and 1 glycerin molecule. Just for the record, an acyl is a straight line of neutral molecules. The shorthand for Triacylglyceride is TAG because, as Dr. McSoapy pointed out, AAAG sounds like something is stuck in your throat. A Diacylglceride is 2 made up of 2 acyls and 1 glycerin. It’s called a DAG. A Monoacylglyceride is 1 acyl and 1 glycerin. Guess what it’s called? No peeking at the answer yet. Did you get it? Right! A MAG. Dr. McSoapy showed us all kinds of colorful diagrams. A molecule here, a molecule there. Put them together and get something different. There’s a name for that. Stoichiometric — stoichiometric is how much of this will go with how much of that. How’s that for technical jargon? To me it’s how things go together to make a balanced equation. Mostly. He made it so easy to understand. But I’m struggling with passing along that knowledge. So you probably ought to read his book instead of relying on my secondhand rendition. So let me tell you about some of the things I took away from the session. Things that make more sense to me than acyls and glycerin. We did an experiment. He had bottles of soapy water ready for us. He also had pipettes with either ammonia or vinegar. He had us shake the bottle to get the bubbles going. Then we added a few drops of vinegar. Guess what? The soapy bubbles disappeared. They ALL disappeared. Like magic. But it’s not magic – it’s soapy science. Here’s where it gets really cool. 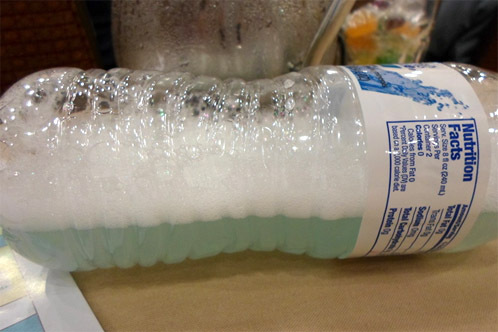 To this bubble-less soapy water, we added a drop of ammonia. We shook the bottle. Voila! The bubbles were back (see picture of bubbles above)! Fun times. Dr. McSoapy told us about some of his research. One very interesting finding he shared concerns lye heavy soap. You may have read/heard that cold process soap gets milder over time. To test this idea, Dr. McSoapy and his team did an experiment on a lye heavy soap and showed us the results. A soap started out lye heavy (can you say ouch?) when it was poured. I don’t remember the exact pH, but it had too much lye in it. After 24 hours, the soap was still lye heavy. However, after 11 weeks, the soap had a pH level very close to normal for soap. The pH was at a safe level. He explained that this happens because the CO2 reacts with the leftover lye to eat it up. Well, those may not have been his exact words, but that’s what my brain heard. Anyway, it was very interesting to me that in a relatively short amount of time, a lye heavy soap would become a safe soap. The conditions in which the soap cured may have an effect on how quickly the soap becomes safe. 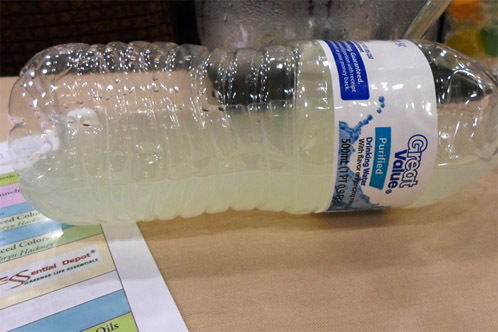 If you end up with a lye heavy soap, be sure to check the pH if you plan to use it. If you make soap from scratch, you know the drill. Every soap may not reach a safe level within 11 weeks as the experimental soap did. The other finding that I will remember most from this session? Lye Discounting (adding less lye than the oils will use) vs. Superfatting (adding an oil after trace). Based on his research, Dr. McSoapy believes the evidence suggests that superfatting and discounting lye create a similar end result. Why does he think this? Because he has this fancy doodad that can separate out and measure what fatty acids are left over in the soap. And he knows (as we can, too, if we do our research) which fixed oils contain which fatty acids and how much. The fatty acids remaining in the soap were not always from the oil added after trace. And the amounts and types of left over fatty acids were very similar between superfatted and lye discounted soaps that had been made from the same recipe. Some oils react with lye more quickly than other oils do. 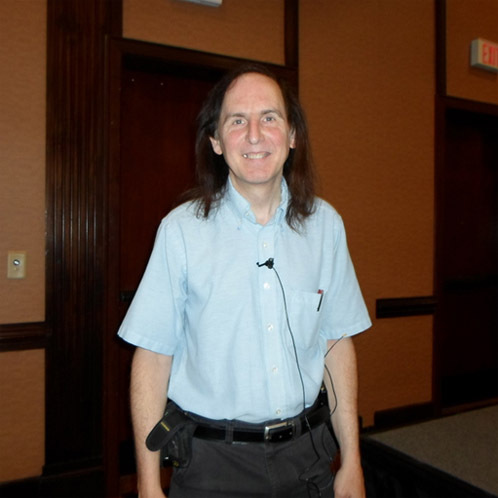 Thank you, Dr. McSoapy for the wonderfully informative and entertaining session. Thanks, Jean! 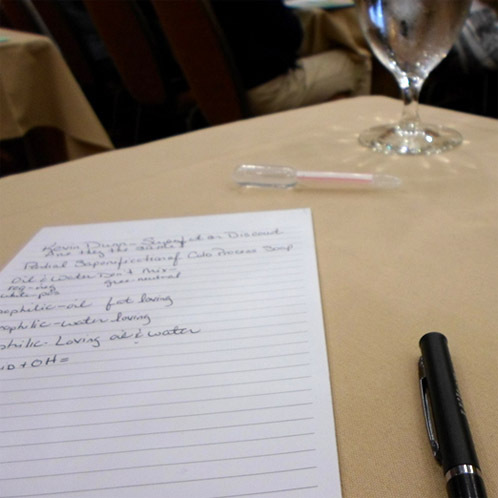 Our other conference guest blogger, Michele of Tierra Verde Soaps, also attended this class. Get her take on it here! Sarah- I think his finding that superfat and lye discount accomplish the same thing probably turned a lot of soaper’s worlds upside down. What an interesting and possibly unexpected finding. As for how to know what oils react more quickly, I seem to remember that the ones that come to trace more quickly tend to be the faster reactors. But I’m not positive. Maybe there is more about that in his book. I do believe you are right that it has to do with the oil’s constituent fatty acids, if my memory serves me correctly. He was able to tell when was left because of his high tech device that could separate out the fatty acids. I’m not sure whether there is a way for the every day soaper to do that. I do remember that jojoba oil acts differently since it’s really a wax ether and not an oil. It’s all very interesting, and there is so much to learn! Being a science geek, I was compelled to go ahead and order his book, “Scientific Soapmaking: The Chemistry of the Cold Process”. Can’t wait to find out what treasures are buried between its cover. Hopefully, more on oil reaction times. Too bad we can’t all have a handy-dandy hi-tech device for separating and measuring fatty acids. I’m sure you will love his book! I hope you find lots of exciting treasures. Soaping chemistry is indeed fascinating. And Dr. McSoapy’s finding that lye discounting and superfatting create a similar end result has turned my soaping world topsy-turvy. When making CP soap I typically do a percentage lye discount to ensure a gentle soap plus a percentage superfatting using oils with characteristics I want to retain in my completed soap. So given Dr. McSoapy’s finding, how does one identity the oils that react with lye more quickly vs the ones that react more slowly? Is it based on the molecular weight of an oil’s constituent fatty acids? Or something completely different? Here I was thinking I had total control of my soap and find out that it isn’t so. I need to regain that control (so says my OCD). I will have to see if I can find his book. I am from the town of Farmville, VA which is about 5 miles from Hampton Sydney College and lived next door to Kevin and his wife for a few years. I didn’t remember what subject he taught there so I was surprised seeing this article on him. I live here in WA State now, it is a small world. Wow, Debbie. It is a small world! I really enjoyed getting to meet Kevin and attend his chemistry lesson. I enjoyed the post. I come at this from the other side. I’m a research chemist who is toying with the idea of playing around with making some soap. The reason vinegar killed the bubbles is that you actually ran the saponification reaction in reverse. Soap is a salt of a weak acid and a strong base. Mix that salt with a stronger acid like vinegar and you end up with your unreacted oils dispersed in water. Add more base like ammonia and the reaction goes forward once again to make the salt/soap. Ahhh….now this is the guy I’d really like to chat with had I been able to attend the conference! But this post got me to thinking… I found he has a soap making forum, so I’m going to sign up! Yay! I have his book, but as yet have not made my way through it entirely. Dr. Dunn is an entertaining speaker loved by all! That he can interest us to such a point with chemistry is quiet an accomplishment on his part! Yes I too had a fun laugh and the water and bubble experiment was grand. He always has some type of hands on item to share and make his point with. Jean great job! Thank you for your post and keeping it all straight! How cool! The chemistry behind soap making is so interesting! And Kevin Dunn is such an incredible teacher! I received his book last year at a soapmaking seminar, and it truly changed how I soap. Awesome stuff! I bet it was a great experience to hear him speak! Thanks for sharing what you learned! it is so interesting to hear and I wish there were something like that here in my country. I plan to go there one of these days and visit you . I got so excited eveeytime I visited the soap supply store. It’s like a kid going into a candy store. I will post a picture of the soap I made soon. Just wanna share :). For more information on soapmaking, I’d definitely take a look at some of the books found on Bramble Berry’s website. I’ve learned quite a bit from the soaping reading I’ve been doing and can’t wait to dig into the newest books. Is there a particular type of soaping that you like doing best? As promised I’ve uploaded the Charcoal Soap which i did recently on your FB Page..
Great job Jean! So fun to see how your post varied from mine. I really enjoy your humor. Thanks, Michele! I’m anxious to read your post!